Let me introduce you to Unix and Linux � the richest, most satisfying computing environment in the world � and enjoy a kind, gentle approach to this highly technical area of computing. Note: This book replaces Harley Hahn's Student Guide to Unix. 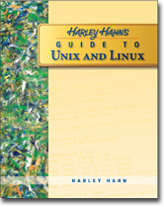 Harley Hahn's Guide to Unix and Linux is suitable for anyone who want to learn basic Unix and Linux. 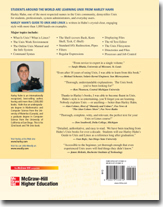 Because it was designed to be a college and university textbook, there are a variety of special resources available to instructors and students. What Is Unix? What is Linux? Excerpts from the "Gnu Manifesto"
What type of Unix Should You Use? How Do You Get Linux or FreeBSD? Who Is in Charge of X Window? Does Microsoft Windows Have Runlevels? How Does Unix Know What Type of Terminal You Are Using? How Do You Stop a Program? What Happens When You Enter a Command? How Can You Learn So Many Options? Which Shell Should You Use? When are Initialization Files Executed? Should You Create Your Own Filters? When Do You Use look and When Do You Use grep? Why Is There More Than One Directory for Programs? Is It Possible to Restore a File That Has Been Deleted?